VINTAGE KODAK FOLDING BELLOWS CAMERA: No 3A AUTOGRAPHIC, MODEL C. c1921. CLEAN. Vtg Kodak No. 3A Autographic Folding Camera Red Bellows Leather Case!!! 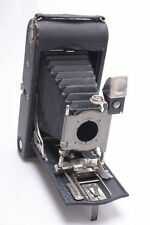 EASTMAN KODAK NO 3 A AUTOGRAPHIC Model C Folding Bellows Camera WITH CASE-NICE! KODAK No.3A Autographic Kodak Jr.
Kodak Autographic Folding Pocket Camera 3-A - RARE Red - VINTAGE FOLDING CAMERA! This page was last updated: 25-Apr 02:25. Number of bids and bid amounts may be slightly out of date. See each listing for international shipping options and costs.